The protection of your premises is highly important and a cause of great stress and worry. 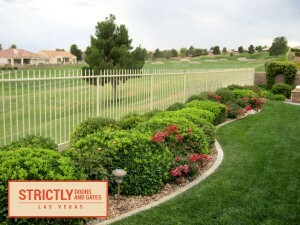 But now you can breathe a sigh of relief as you can get the toughest security for your property with the best quality iron fencing in Las Vegas by Strictly Doors and Gates. These fences have been manufactured from the finest-quality iron, and they stay firm as a rock while keeping trespassers at bay. Strictly Doors and Gates caters to commercial fencing requirements which today stand tall and more demanding than the barb wires of yesteryear. Renovating the standards of the commercial fencing industry, they are offering products that are perfectly appropriate for the challenging security demands of commercial spaces. These Iron Fence in Las Vegas offered by Strictly Doors and Gates work for both industrial and commercial properties, and are offered at highly reasonable prices, as well. Strictly Doors and Gates also provides a wide range of iron fences with sturdy structures and exclusive designs for residential fencing demands. These fences have been designed for the purposes of both security and décor, and the company offers plenty of designs keeping in mind the diverse exteriors of different homes. The Strictly Doors and Gates ornamental fences product range is valued for its durability, maintenance-free coatings, and resistance to abrasions and rust. Both the commercial and residential fences at Strictly Doors and Gates are quality-made and easy on the buyer’s budget.